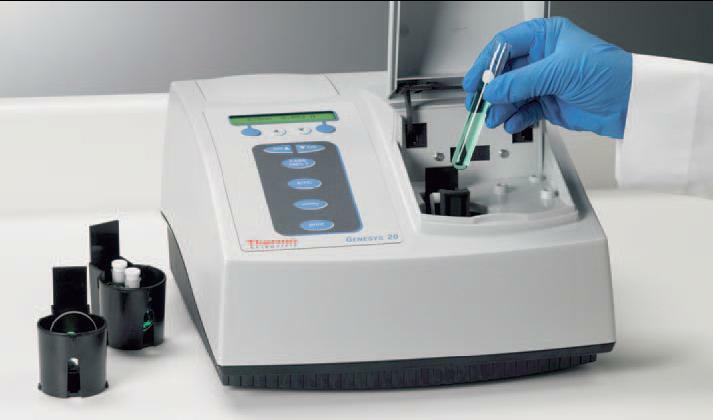 Thermo Scientific* GENESYS* 20 is a compact, low-cost, easy-to-use, Visible spectrophotometer designed for classrooms and routine laboratories. A simple, 4-step measurement process and optional VISIONlite* software make the GENESYS 20 the most cost-effective, visible spectrophotometer available. Includes: Units include Single-position cell holder, five disposable cuvets, RS-232-C interface, Centronics-compatible printer port, dust cover, operating manual, and U.S. power cord. Warranty and Service Offering: One year. †Measured using 930D filters supplied by NIST*.